Make Qt applications work with Firebird database. NB:If you see this post and you like it, please follow https://rongsheng007.wordpress.com. Thx. In the last post, we have already figure out how to connect to the firebird database in Linux/UNIX environment. 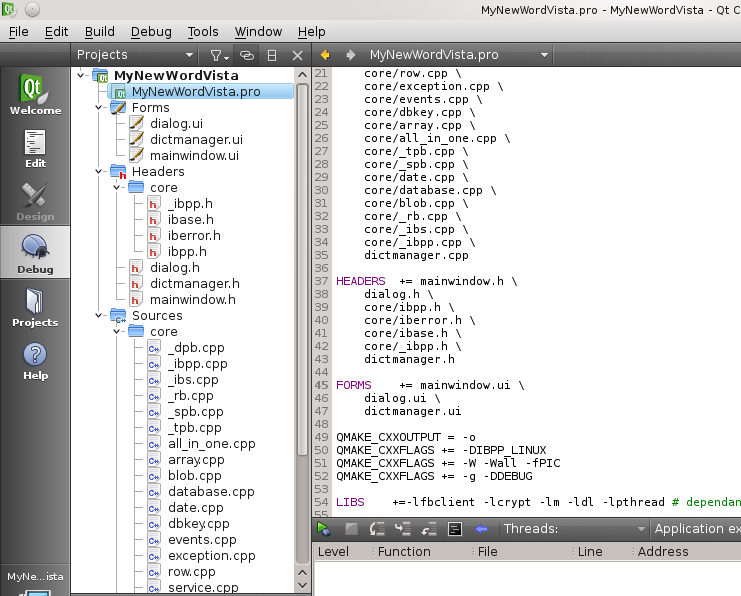 In this post, I will use application built in Qt framework to connect the firebird database and do simply task. To allowing Qt applications connect to the firebird database, we need some tools, here I introduce the IBPP project. IBPP stands for InterBase Plus Plus. IBPP is a client interface written by a group of people which provide connectivity with Interbase database system. Firebird, as is described in previous post, derived from Interbase system. Thus it is natural that IBPP interface support firebird too. To begin, download the IBPP source code package from: http://sourceforge.net/projects/ibpp/files/, and unpack to your desired folder. Note that this post is based on the IBPP version 2.5.3.1, all the following configurations are based on this version. You will find two folders in the destination folder where you unpacked the file into. One is “core” and the other is “tests“. (We assume that you already has a Qt project, if not, build one.) Copy all the files from the core folder to your project files location, and put them into a new core folder if you want to. Now open the project with Qt Creator, and add these files into the project. Open the project file(.pro) in the Projects explorer, and add the following in your project file. Well, I believed that ALL things are set, what we need to do is to test if it really works. Open a file in your project and try the following way to connect to the database. Now run this program, if you assign a blank database file, you could see a error messagebox showing up. IBPP::Transaction itran = IBPP::TransactionFactory(ibpp,IBPP::amRead,IBPP::ilConcurrency,IBPP::lrWait,IBPP::TFF(0)); //Initialise the transaction class which defines the transaction procedure. IBPP::Statement istat = IBPP::StatementFactory(ibpp,itran); //The class which contains the SQL statement to be executed. 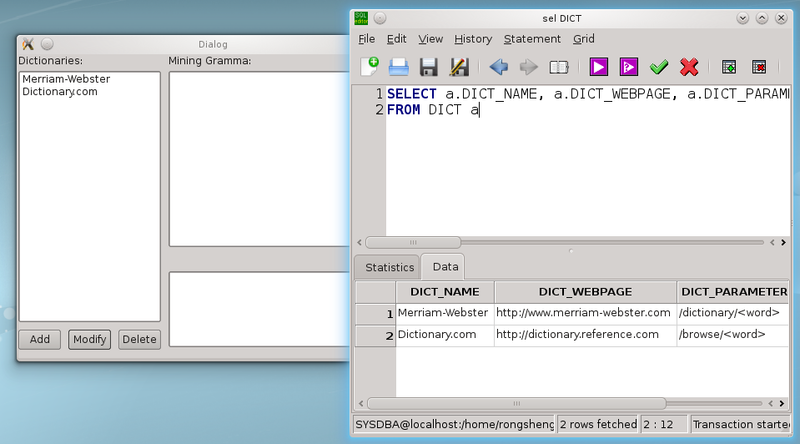 std::string sql = “select * from DICT”; //our sql statement. istat->Prepare(sql); //write the sql statement into the class. std::string result; //we define a string here which used to get the result that returns. ui->listView->setModel(qmodel); //bind the QStringListModel to QListView. 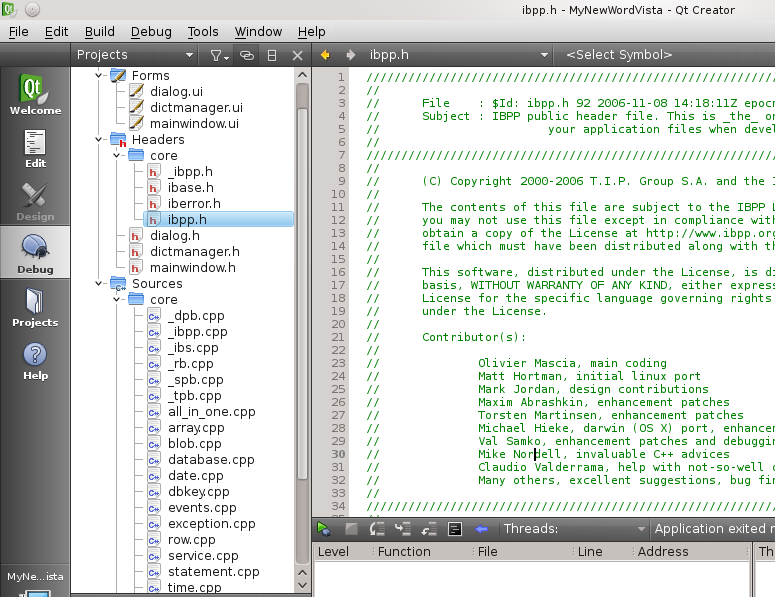 //qmodel is a QListView which we created using Qt Design. Now, we can really say everything is done! Phew:). Here is the snapshot of result. ← Set up and Connect to the Firebird Database.